Summary: One moment of recklessness will change their worlds. 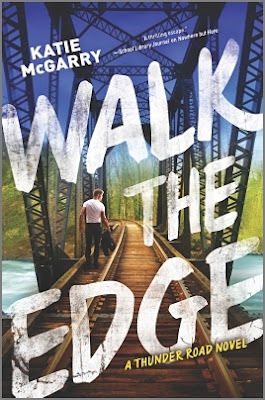 If Crash into You is my favorite in the Pushing the Limits series, then Walk the Edge has taken that honor in the Thunder Road series. All the emotions and feelings that Breanna and Razor gave me were very reminiscent of what Isaiah and Rachel make me feel – which is love, heartache... and mama bear protectiveness. I was so curious about Razor after meeting him in Nowhere but Here, and he surpassed my expectations in this story. There is so much more to him than meets the eye. I adore this boy. And I adore his girl. But my heart broke for these two. I wanted to pluck them from the pages, take away their struggles and sadness, and plop them back down in a perfect happily-ever-after. You know who I don’t love, though? Breanna’s parents – while I’m not a fan of several of her siblings, it’s her parents who made me downright livid. As in red-faced, steam-coming-out-of-my-ears, let-me-at-em livid. Okay. I’ll be honest. I just backspaced quite the rant about Breanna’s parents. But I need to keep this spoiler-free, so you will have to experience them yourself and draw your own conclusions there. I’m going to take a couple of deep breaths and walk away from this paragraph. This story is an excellent cautionary tale for the young and not-so-young alike: the internet is a scary place. Wifi is NOT safe. Social media is NOT your friend. And high school is just as evil as I remember it. I’m so relieved my high school days are nothing more than bitter, crappy memories. I’m more relived that my daughter has so far survived her high school days happy and relatively unscathed. Reading what Breanna suffers through makes me forever grateful that I grew up in the time that I did BUT beyond terrified that this is the age I’m raising my daughter in. Seriously scarier than both horror books I read last month. Combined. I promise there is much more in this amazing story than heartache. There are also some incredibly happy things. Like the Reign of Terror family. And I do call them a family. They are more loving and loyal to each other than a lot of people I know who share the same DNA. There’s several things about the MC lifestyle that I struggle with… but the way they always have each other’s backs? That close and easygoing camaraderie they share? Yeah, I fully support and love the heck out of that. It can be difficult to read YA at my age; but I like to know what my daughter’s reading, and I enjoy bonding with her over books so I do read quite a bit of this genre. But my goodness can Katie McGarry tell a story. She always has me completely enthralled and so incredibly invested in her main characters as well as the captivating ensemble of secondary characters. When McGarry is the author, I don’t feel the age difference. She makes me 18 again and a part of Snowflake. While you couldn’t pay me enough money to go back to high school, I sure wouldn’t mind visiting Snowflake (Eli) and and all the wonderful characters that live there (Eli). One of my favorite authors, one of my favorite stories, one more favorite book to share with everyone I know. Special thanks to the publisher for a copy of this book in exchange for my honest review. You know I'm loving this one as you have received many a rants about certain characters lol I cannot wait to finally sit down and finish this one because I am dying to know all the things. I adore Razor and Breanna. Wifey our twin powers were working again... because in my notes I have "this book makes me so glad I went to HS in the very early days of social media and not now". It is horrible to think how in this day and age one mistake can live on forever. Anyhoo I adore this review and I adore you. That does not surprise me a bit -- we're so lucky to have missed this kind of craziness in HS. Thank you, wifey. Love you big! This sounds so fantastic! I'm not a YA fan, but I do enjoy this author! Oh wow! This looks like such an interesting read! And high five for reading it to better relate to your daughter. That's admirable! I just love the sound of this one and I know I'll love the characters because I already do. It really is an amazing story and I'm glad you enjoyed it so!I can't wait to pick it up *HUGGLES* You are amazing!